According to the prototype approach, the category of Serial Verb Construction (SVC) is organized around an exemplar with which language-specific instantiations comply to a greater or lesser degree (Aikhenvald 2006, Dixon 2006; see also Crowley 2002). The SVC prototype consists of two finite verbs that can occur independently outside an SVC; it exhibits a unitary TAM interpretation, polarity value, and argument structure; denotes a single event; exhibits a cohesive intonation pattern; functions as a single predicate and a single clause, which precludes any type of clause combining, in particular, subordination, complementization, (conjunctive) coordination, and consecutivisation (Muysken & Veenstra 1994, Aikhenvald 2006, Dixon 2006, Bisang 2009). The varying degree of canonicity exhibited by language-specific SVCs reflects these constructions' advancement on the grammaticalisation path that connects multiclausal structures and SVCs. At an intermediate stage, less canonical SVCs preserve visible traces of their diachronic multiclausal origin: while in most aspects, they comply with the SVC prototype, they also exhibit formal features of multiclausality; specifically, morphological markers of clause-combining. Such markers are nevertheless dummy - the true multiclausal relationships being weakened or absent (Aikhenvald 2011, Andrason 2018). Coordinating and subordinating dummy elements in less canonical SVCs, and coordinating and subordinating sources of SVCs, are well attested to and comprehended (Aikhenvald 2006, 2011:21-22; see also Johannessen 1998:49-51). In contrast, dummy consecutivisers and the consecutive origin of SVCs are documented and understood to a lesser extent, even though the relationship between SVCs and consecutive structures has been noticed (Ameka 2006). Given the prototype theory of SVCs and their dynamic interpretation in terms of a grammaticalisation path (Aikhenvald 2006, 2011), consecutive patterns should generate SVCs like other multiclausal structures. Crucially, similar to pseudo-coordination and pseudo-subordination, markers of consecutivisation should be weakened to dummy elements during grammaticalisation towards SVCs. I will argue that isiXhosa attests to such pseudo-consecutive, non-canonical SVCs. BUYA complies with most features characteristic of the SVC prototype. V-1 and V-2 are inflected in finite categories - they are marked by noun-class Subject Agreement prefixes (e.g. nda- in (1)) and by TAM suffixes. V-1 appears in all TAM categories available in isiXhosa (Oosthuysen 2016:301), e.g. Remote Past (ndabuya lit. "I returned" in (1)), Present (ubuya lit. "I return" in (2)), and Future, composed of the Present of "come" and an Infinitive (uza kubuya lit. "I will return" in (3)). In contrast, V-2 is always inflected in the Consecutive (ndathetha "I talked" in (1)) or Subjunctive (anike "he gives" in (2)). Both verbs can occur on their own outside BUYA. In such cases, V-1 means "return" (ndibuya esikolweni "I return from school"), while V-2 exhibits its lexical value, analogous to that found in its uses with V‑1 buya. BUYA expresses a single event. Temporal (izolo "yesterday" in (1)) and spatial (esikolweni "at school" in (4)) modifiers obligatorily operate over the entire construction, not over V-1 or V-2 separately. 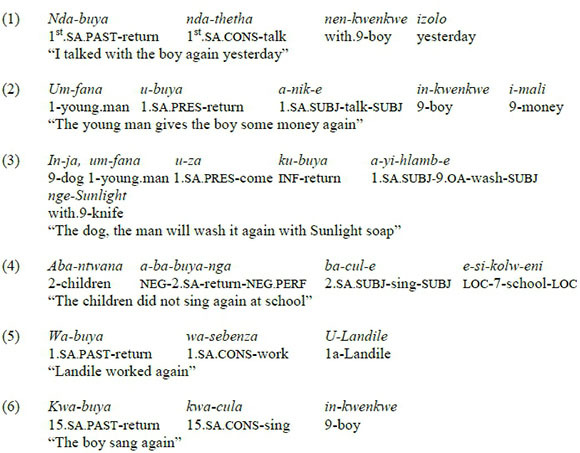 The same holds true for adverbs of manner, means, or instrument (nge-Sunlight "with Sunlight soap" in (3)), and other types of adjuncts (nenkwenkwe "with the boy" in (1)). When interviewed, speakers perceive the expressed event as unitary (i.e. an action or activity occurring again), not as a sequence of two events or their overlapping occurrence. In these mono-event readings, the lexical type of event draws from the semantics of V-2 (e.g. talking in (1), giving in (2), washing in (3), singing in (4), and working in (5)), while V-1 communicates an aspectual nuance of repetition, translatable as "again" as in (1) - (5). BUYA exhibits a cohesive type of intonation, with no pause or bi-clausal contouring. As demonstrated by examples (1) - (5), the chain of V-1 and V-2 tends to be uninterrupted. Crucially, when moved out of its canonical preverbal position, the nominal subject occupies the construction-final position, rather than being placed between V-1 and V-2 (see uLandile in (5)). For that reason, in (6) - with the mono-event reading - only Kwabuya kwacula inkwenkwe is acceptable, while *Kwabuya inkwenkwe yacula (lit. gloss: 15.SA.PAST.return 9.boy 9.SA.CONS.sing) is ungrammatical. BUYA exhibits a single polarity and TAM value. Polarity and TAM have the entire construction as their scope, not only the separate components. Negation is expressed only once, appearing on V-1 (ababuyanga lit. "did not return" in (4)), although it operates over V-2 as well. BUYA assumes a unitary argument structure. As illustrated in all the sentences, the subject of V-1 and V-2 always coincide. The internal valency draws from the argument structure of V-2 and operates over the whole construction. If V-2 is intransitive, as in (1), (4) and (5), transitive, as in (3), or di-transitive, as in (2), BUYA is also - holistically - intransitive, transitive and di-transitive, respectively. The fact that V-1 only appears in the short forms of the perfect/recent-past and the present, as in (2), is consistent with the monoclausal interpretation of BUYA. This squib argued that the BUYA gram found in isiXhosa constitutes an example of a pseudo-consecutive non-canonical SVC. BUYA complies with most features postulated for the prototype of a SVC - the main exception being the presence of the consecutive marking on V-2. However, as BUYA fails to exhibit various properties that are characteristic of genuine consecutivisation, this marking is dummy. BUYA - the BUYA gram; CONS - consecutive; FUT - future; LOC - locative; NEG - negative/negation; OA - object agreement; PAST - the A "remote" past tense; PERF - perfect, "near" past tense; POS - possessive; PRES - present; SA - subject agreement; SUBJ - subjunctive; SVC - serial verb construction; V-1 and V-2 - the first and the second verb in the BUYA gram; 1(a), 2, 3, 9, 15 - noun classes. 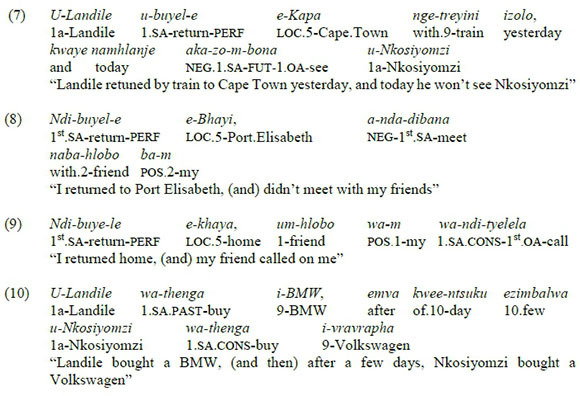 1 In isiXhosa, there is a large set of such bi-verbal structures. Apart from buya, other examples of V-1 are: andula "begin"; fana/fumana "just/only"; hle "suddenly"; khawuleza "quickly"; khe "once/never"; phantse "almost"; qala "first/begin"; qokela "again"; shiya "greatly"; suka "just/ then"; tshetsha "quickly"; ye "just/without reason"; ze "must / [negative] "never"; zinga "constantly" (Visser 2015). In all such constructions, V-2 specifies the semantic type of an action, while V-1 contributes to its aspectual or modal interpretation (ibid.). 2 These features are also incompatible with a crosslinguistic prototype of conjunctive coordination (see Haspelmath 2004 and Andrason 2016). They are, in contrast, common in pseudo-coordinated structures (Johannessen 1998:49-51). 3 Overall, sentences like ndabuya ndathetha may, at least in principle, have two interpretations: a mono-event interpretation ("I talked again"; i.e. as the BUYA gram) and a bi-event interpretation ("I returned and spoke"; i.e. as a genuine consecutive pattern). In many cases, due to a broadly understood context, a given construction built around the verb buya can be disambiguated, such that only one reading is acceptable. Crucially, certain syntactic operations are ungrammatical in genuine consecutive constructions, while others are excluded from the SVC BUYA. See, for instance, (4) where a bi-event interpretation "The children did not return and sang at school" is implausible (as nearly nonsensical), and (9) where a mono-event reading "My friend called me again" is impossible (as the subject arguments of V-1 and V-2 do not coincide).